Polymorphonuclear leukocytes, or PMNs, are a special family of white blood cells. The family includes immune cells known as neutrophils, eosinophils, and basophils. Neutrophils, basophils, and eosinophils are all PMNs that can be found circulating in the bloodstream. In normal blood test results, however, the most common PMN by far is the neutrophil. Aside from PMNs referring to a group of named cells, the term also refers to their appearance. Poly + morph relates to “different shapes” and nuclear refers to the cell nuclei of PMNs when stained and viewed under the microscope. PMNs are thus known for the odd assortment of shapes that their nuclei can take on. Nuclei of PMN white blood cells have deep partial divisions so that instead of looking like a nice, round circle in cross-section, they may appear to have two or three lobes. These lobed nuclei cause the “fried egg” appearance, so common with many other cell types, to be noticeably absent—instead, the cell looks like an egg that had its yolk broken while being cooked. Yes. In addition to funny nuclei, PMNs also have granules that can be seen using dyes and stains; the granules are like tiny water balloons within the cell, and they give PMNs their grainy appearance. For this reason, PMNs are also frequently called “granular leukocytes” or granulocytes. What’s inside the granules depends on which PMNs you are talking about. In the case of neutrophils, the granules contain enzymes and substances with antimicrobial properties that, when released, help fight infection. Where do PMNs Come From? PMNs as well as other types of white blood cells, red blood cells, and platelets all descend or develop from hematopoietic stem cells in the bone marrow. From hematopoietic stem cells, blood cells differentiate along two major, distinct pathways: the lymphoid cell line which goes on to become lymphocytes, and the myeloid cell line, which gives rise to different types of PMNs, in addition to other blood cells. PMNs are white blood cells that may be found in the blood. However, white blood cells often are able to follow chemical signals, migrating to different cites in the body where they are needed, you can also find PNNs in other areas, such as at sites of infection or inflammation. Do They All Function in the Same Way? No, each of the different PMN white blood cells has a slightly different role in health and disease, and they can be involved in different processes within the immune system, though there is some overlap. As with all white blood cells, the same PMN that might be helpful in immunity and in fighting infection might, in other instances, play a role in potentially harmful or imbalanced responses, such as allergies and serious allergic responses. When it comes to patients with cancer, neutrophils are the most important PMN in fighting infection. In fact, they are the most important infection-fighting WBC, period, according to the American Cancer Society. To get a good sense of your neutrophil count, doctors use a measurement called the absolute neutrophil count, or ANC. A healthy person has an ANC between 2,500 and 6,000. Neutrophils: Neutrophils are the front line of defense against bacteria, viruses, and fungal infections, and they are the first to appear on the scene. When there is a tissue injury, substances called chemotactic factors are released which attract neutrophils. Eosinophils: Eosinophils work in allergic reactions and also against parasitic infections such as worm infestations. High levels of eosinophils in the blood can result from other conditions, too, such as drug reactions. Basophils: Basophils are also involved in allergic reactions, and they secrete histamine and other compounds that result in inflammation and prevent blood from clotting. Basophils are the bloodborne equivalent mast cells, which are strictly tissue-bound (basophils are in the bloodstream; mast cells are in the tissues). Mast cells: In the tissues, mast cells play an important role in respiratory and digestive conditions. Mast cells exist in 2 major subtypes: connective tissue and mucosal. Both subtypes can release preformed granules. Mucosal areas are linings, such as the lining of the intestines, or the lining of the airways. Connective tissue exists deeper than these linings and in other structures, as well. In both subtypes, mast cells may become activated and degranulate, or give up their payload of granules. Substances within their granules act as cell signals and work in concert with other immune cells. PMNs are part of the non-specific innate immune system. What this means is that they treat all intruders in a similar fashion. The term innate means that this system is present from birth — the cells don't need to learn to recognize the invaders. They recognize them from the get-go. This contrasts with the acquired immune system. In the acquired immune system, the immune cells can learn to recognize an invader and mount an immune response. The response is often complex and multifaceted, involving immune cells known as B and T lymphocytes, as well as antigen presenting cells, or APCs, which specialize in alerting the lymphocytes as to the presence of a foreign antigen. High levels of neutrophils in the blood are most often caused by infections, as these cells are called on to defend the body. Certain blood cancers, including chronic myelocytic leukemia, polycythemia vera, myelofibrosis, and myeloid metaplasia result in increased levels of neutrophils, but there are many other non-cancerous causes as well. When the body does not have enough neutrophils, this can correlate with a person’s risk of developing an infection. Certain cancer therapies can cause neutrophil levels to fall, resulting in what's known as neutropenia. In chemotherapy-induced neutropenia, health care providers guard against the risk of infection in a variety of ways. 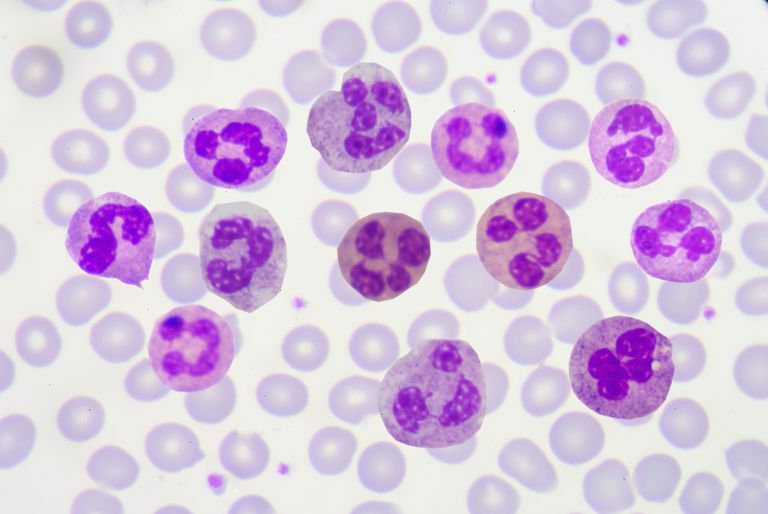 An excess of eosinophils is termed eosinophilia, and is often caused by allergic reactions, drug reactions, or infections with parasites, and less commonly by cancer and other conditions. A deficiency in these cells is uncommon. An excess of basophils may occur with hypothyroidism and with some blood cancers. Other disorders linked to excess basophil levels include Crohn disease and ulcerative colitis—both of which are considered inflammatory bowel disease. Stevens B, Maxson J, Tyner J, et al.Clonality of neutrophilia associated with plasma cell neoplasms: report of a SETBP1 mutation and analysis of a single institution series.Leuk Lymphoma. 2016;57(4):927-934. Why Is Too Many Red Blood Cells a Problem?